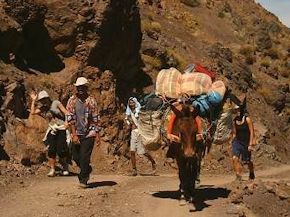 Volunteer project: This trekking and intercultural exchange program provides a unique opportunity for discovering the former imperial city of Marrakech, trekking in the High Atlas mountains and doing some solidarity work with the local population in the mountains. Participants will get to know the Moroccan culture, while visiting Rabat and Marrakech not only as tourists, but to enjoy a true cultural immersion experience, participating in different activities. The main aim of the project is to promote cultural understanding. In the first week, the volunteers will stay in Rabat, in a host family and will volunteer teaching languages. After that, they will move to the mountains, where they will live in a private house, rented for the project. 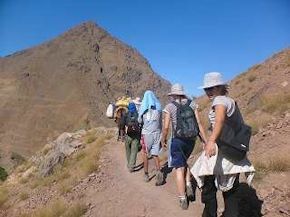 There will be guided trekking in the Marrakech mountains. The group will also do some social volunteering. The work with local population in the mountains may include school renovation, playing with kids, cleaning a water stream, distribution of clothes or other necessities such us books, educational materials, food, etc. 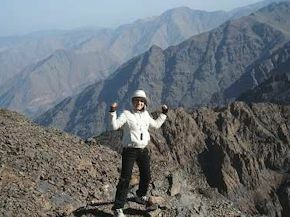 Special requirements: The volunteers are not required to have any previous experience volunteering of trekking. We are looking for enthusiastic, positive and respectful people, who are willing to work close with people from other nationalities, to learn new skills and develop new relationships in ways that they choose and at a pace they feel comfortable with. Accommodation: The volunteers will live with a host family in Rabat and in Marrakech they will live in a house. Location: Rabat is the capital and fourth largest city of Morocco with an urban population of approximately 580,000. Located along the Atlantic Ocean, Rabat has a mild, temperate climate, shifting from cool in winter to warm days in the summer months. The biggest theatre place is the Theatre Mohammed V in the centre of the town. The city has a few official galleries and an archeological museum. Known as the "Red City", Marrakech is the most important former imperial city in Morocco's history. The city of Marrakesh is the capital of the mid-southwestern economic region of Marrakech-Tensift-Al Haouz, near the foothills of the snow-capped Atlas Mountains. Like many North African cities, the city of Marrakesh comprises both an old fortified city (the médina) and an adjacent modern city (called Gueliz) for a total population of 1,070,000. It is served by Ménara International Airport (RAK) and a rail link to Casablanca and the north. Marrakech has the largest traditional market (souk) in Morocco and also has one of the busiest squares in Africa and in the world, Djemaa el Fna. The square bustles with acrobats, story-tellers, water sellers, dancers and musicians. Volunteer project: The program is an opportunity for the participants to explore Moroccan culture, especially the one from the south of Morocco and the Sahara Desert, which fascinates everyone who comes to visit. The volunteers will have the opportunity not only to visit the Desert, but also to enjoy the local culture and to get immersed into it, participating in different activities. The main aim of the project is to promote interculturality. Cultural visits will be organised to places in South Morocco (excursion to the oasis of Zagora and to the mountain, visiting an old kasbah, a historical library and a museum). An excursion to the Sahara Desert will be also organised in the end of December for the volunteers to celebrate the New Year in the Desert. The group will take part in some voluntary activities and a pottery course. The volunteer tasks include painting and gardening in a local school. The participants will learn about the Moroccan artisan techniques of making pottery. They will get knowledge about how to make pottery articles, from working and preparing the earth to decorating the articles. This activity doesn't require individual skills but it demands your motivation to overcome the difficulties. All the materials needed for this activity will be provided. The volunteers will learn how to cook some delicious Moroccan food. They will also spend time and organize activities for 400 local children in Zagora. Accommodation: The volunteers will be hosted in a youth center or in a family house, depending on availability. Location: Zagora is a beautiful town in the south of Morocco, near the Algerian border. Zagora is about 750 km from Rabat and about 250 km in the south of Ouarzazate. The town of Zagora sits at the foot of Anti-Atlas Mountains and on the shore of the Draa Valley in South Eastern Morocco. Zagora’s allure is mainly attributed to the great Draa Valley, which is still a home for several of Morocco’s tribes. The name Zagora is derived from “Tazagort,” a mountain by the shore of Draa Valley overlooking the city. Zagora gathers a number of minority groups, including numerous Amazigh tribes from Ait Atta clan, and black African groups who emigrated from Sub-Saharan Africa, along with the Caravans. Arabs have also settled in Zagora, coming from Marrakech since the medieval times. Zagora’s historical monuments and natural features are what enchants foreign guests the most. The region still preserves numerous Kasbahs and old fortresses that mark bygone era. In addition, the Sahara desert landscapes of sand dunes and “Hamadas” is also worth discovering. The artistic characteristics of Zagora lay in crafts, as well as folklore. Zagora is home of old pottery factories. Clay dishes are exclusively made in Tamegroute, featuring green colored productions and displayed in local and national exhibitions. Reed is also used to make crafts. Folklore in Zagora reflects the cultural identity of the joint communities. Both Amazighs and Arabs of the area, perform different artistic shows, varying from Ahidous to Regba and Hassani rhythms. Volunteer project: This project is an opportunity to learn Arabic and to discover the beautiful country of Morocco. 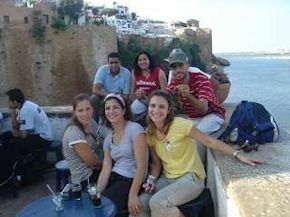 By living with a Moroccan host family, participants will be completely emerged in the local culture and will be able to experience the Moroccan way of life. The idea is to do some volunteer work in the morning in order to contribute to the development of the local community and have Arabic language classes in the afternoon. Arabic is the 5th most commonly spoken language in the world and an official language of the United Nations, the Arab League, the Organization of Islamic Conference, and the African Union. Knowing another language can promote intercultural understanding. People interested in this project can choose between learning Darija (the Moroccan dialect) and Fusha (classic Arabic). Participants will receive 10 hours of tuition per week and will be volunteering in the community in the morning (teaching English, support for disabled children or integration of immigrants). Accommodation: Participants are accommodated in host families. Staying with a local family is an opportunity for the volunteers to use the Arabic language and also to discover the Moroccan way of life. Location: Rabat is the capital and the fourth largest city of Morocco with an urban population of approximately 580,000. Located along the Atlantic Ocean, Rabat has a mild temperate climate. The biggest theatre place is the Theatre Mohammed V in the centre of the town. The city has a few official galleries and an archeological museum.